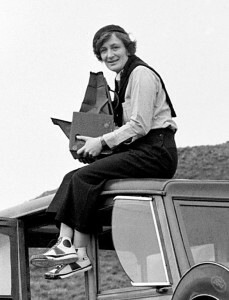 Lange learned photography under the tutelage of the great Clarence White and worked in a San Francisco photo studio during the 1920s. It was not until the 1930s and the Great Depression that she found the subject of her lifetime: documenting the lives of the poor but proud victims of the Dust Bowl. Composed with classical elegance, her photographs convey the intense humanity of people who might otherwise have been relegated to a column of statistics. She recorded the human face of national adversity.